M. Ward will play at Central Park. Nobody would dispute that All Points West's line-up can't be beat -- but the price can. Maybe you didn't cough up the nearly three bills for the festival pass. There's plenty of other music in the city this weekend. For starters, Crystal Castles, who play APW tomorrow, DJ at the horrifically monikered Red Bull Space Friday night (RSVP is required) at an official after party for the festival. Saturday you have your choice of non-APW headliners. Head out to Prospect Park for Dean & Britta, who will be performing their soundtrack to 13 Andy Warhol screen tests gratis as part of Celebrate Brooklyn. The short silent films feature Factory hangabouts and assorted celebs such as Lou Reed (nearly felating a Coke bottle) and Dennis Hopper (looking snappy in tweed). Dean & Britta performed the set this winter at the intimate Rose Hall at Lincoln Center, and it will be interesting to see how the show, titled "13 Most Beautiful," plays outdoors. 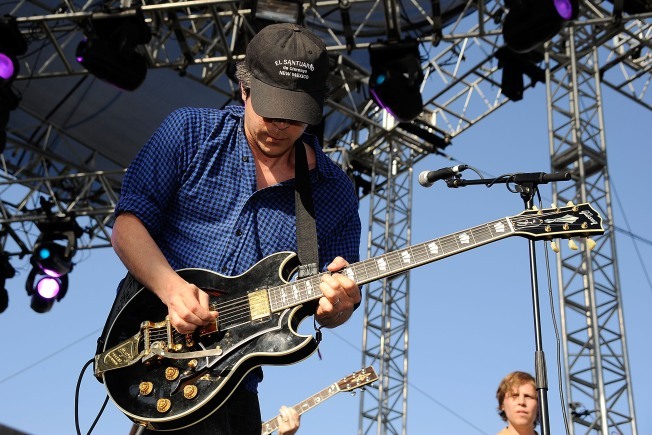 And on your main stage: M. Ward is playing Central Park Summer Stage for free. Starting off the show are is a band called Floored by Four, featuring Mike Watt (legendary Minute Man and fireHose bassist) and Nels Cline (a guitar virtuoso in his own right, who currently plays lead guitar for Wilco). And those are just the free concerts happening on Saturday. If you weren't on a budget you could also trek out to Jone's Beach to catch Lil' Wayne and Young Jeezy, or to the more relaxed confines of The Beacon where Steely Dan will play. Sunday might be a day to sit in the sun and enjoy No Age, Dan Deacon and Deerhunter at East River State Park in Williamburg for the free Pool Party (which is, of course, no longer at the pool). After that, you could shell out $20 bucks and see the old-school punk of Fear and Agent Orange at Europa in Greenpoint. Or if you wanted to keep the free shows coming, saddle over to the Rodeo Bar where The Flying Neutrinos will take it even more old school, with some torchy, New Orleans-hailing, Latin-tinged swing.